RoverTown is the largest mobile student discount program in the nation available to 2.1 million college students on its iPhone/Android app at over 100 schools. RoverTown is the largest mobile student discount program in the nation available to over 2.1 million college students on the RoverTown iPhone/Android mobile app at over 100 colleges and universities. College Student Discount Programs are operated independently and ineffectively across the nation. RoverTown's technology allows each university to easily join the universal RoverTown Student Discount Program while tracking the effectiveness and economic impact of their respective discount program. The goal of the RoverTown Student Discount Program is to effectively connect the university and business community within a college town. This has been accomplished at over 100 colleges and universities by using our state of the art technology including our RoverTown iPhone/Android mobile application, RoverLink business web portal/mobile app, and RoverCore database software for schools. These three software platforms work together in real-time to provide the greatest student discount program system in the world. Students are able to instantly engage with hundreds of local businesses. Businesses are able to add discounts to entice students to visit. And schools are able to effectively monitor the health of their student discount program. Our freemium model allows any business in a college town to have one FREE discount listing and limited access to RoverLink. Businesses can upgrade their RoverLink account to list multiple discounts, create a loyalty program, and much more. Several additional student exposure options are available for businesses to purchase. They include e-mail marketing options, ad network boosts, category sponsorship, bone blasts, and many other. Recurring payments are processed electronically via Stripe, PayPal, or eChecks through RoverLink. In order to effectively measure and optimize our sales results, we use an inside sales approach to working with local businesses. Using our CRM, we track dials, talk time, signups, and other key performance indicators (KPIs) to measure our results and create accurate benchmarks. Mike has worked directly in the mobile coupon industry for the past 5 years. As an Information Technology Systems major, Mike has worked alongside Michael Rzeznik and the development team to create RoverTown's software platforms. Mike is also experienced in marketing, sales, and fundraising. Michael brings his knowledge of over 13+ programming languages to RoverTown. 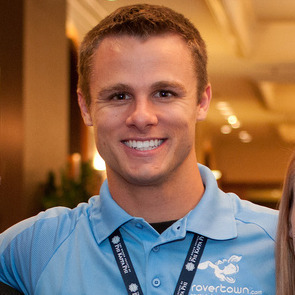 Michael has spent the last three years writing over 2.5 million lines of custom code for RoverTown. Michael's experience includes working for companies such as the NCAA, U.S. EPA, Honeywell, and Cars.com. As a Finance major, Jeffry manages RoverTown's finances along with sales and operations. Jeffry has been instrumental in fundraising with angel investors and spearheading RoverTown's Arch Grant award, joining the Capital Innovators Accelerator, and receiving co-matching funds from the Missouri Technology Corporation (MTC).